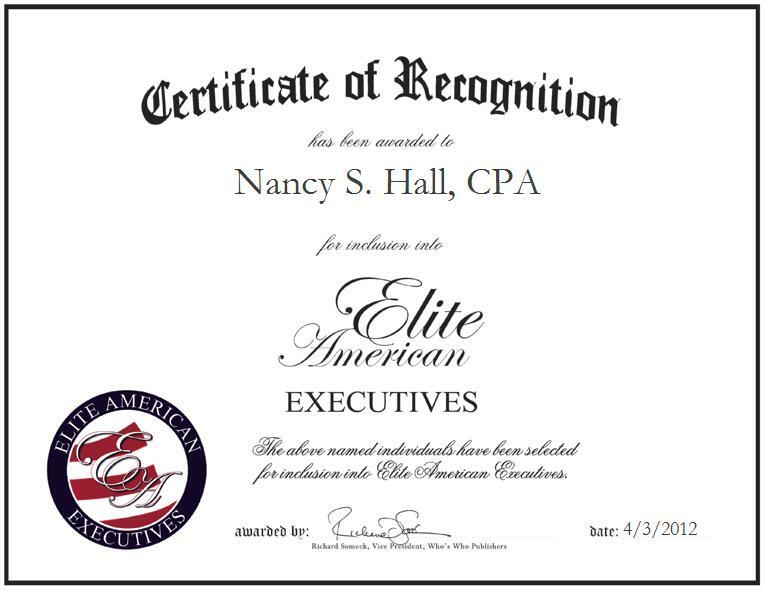 TUCSON, AZ, April 3, 2012, Nancy S. Hall, Certified Public Accountant for Liberty Tax Service, has been recognized by Elite American Executives for dedication, achievements, and leadership in financial services. With a well-refined background in tax laws, Ms. Hall utilizes a sprawling accounting skill set in a capacity that enables her to help others to navigate the rapidly evolving financial, investment and tax laws, in order to ensure their financial security. Ms. Hall currently oversees three Liberty Tax Service offices, supervises staff members, and trains other tax professionals. Her knowledge and experience helped garner for her acknowledgement as the 2006 Business Woman of the Year by the National Republican Congressional Committee. Ms. Hall remains abreast of trends and developments in the financial services sector as a member of the Arizona Society of Certified Public Accountants, the American Institute of Certified Public Accountants, and the AWSCPA. She has amassed more than 21 years of professional experience, and she continues to strive for excellence in her every endeavor.